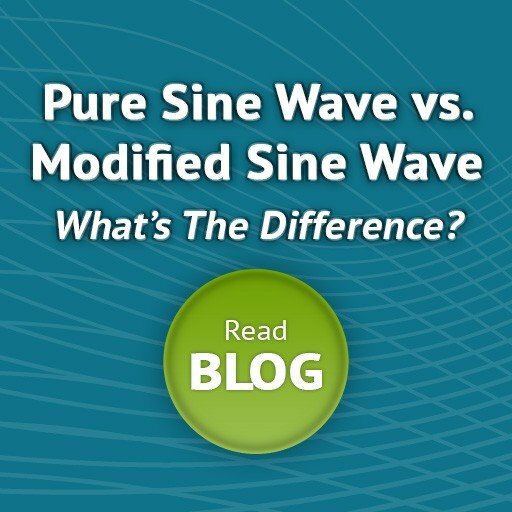 Pure Sine Wave vs. Modified Sine Wave Inverters – What’s the Difference? Solar Power News & DIY Solar Tips > Inverters > Pure Sine Wave vs. Modified Sine Wave Inverters – What’s the Difference? The primary job of an inverter is to convert the DC (Direct Current) power from the battery bank or solar panels to AC (Alternating Current) power needed for most appliances. To do that, it must take the constant DC voltage and change it to a sine wave curve that goes above and below 0 volts. When inverters first came out, the most common way to do this was to make the voltage go straight up and down, creating a blocky signal. This is called modified sine wave, seen in orange in the image below. More advanced modified sine waves make multiple steps, trying to come close to a pure sine wave. In the following images, you can see an output of a modified sine wave on an oscilloscope at the left. A Pure Sine wave is shown on the right. Other than how the signal looks, what’s the difference between the two outputs? In general, because the total harmonic distortion is higher in modified square wave inverters, motors will run hotter (less efficiently, consuming up to 30% more energy than with pure sine wave inverters), and likely not last as long. Additionally, a modified square wave inverter will often cause a “buzz” to be heard from audio devices and sometimes other appliances like ceiling fans and microwave ovens. We liken using a modified sine wave inverter to running a car with square wheels versus a pure sine wave inverter like running a car with round wheels. In the first case the ride is going to be awful rough and depending on the sensitivity of the car’s occupants they may not survive the ride. Pure sine wave is always needed for a grid tie system. It is generally needed for newer LED TVs, CFL light bulbs, and inductive loads like brushless motors. Clocks and audio equipment will behave much better on a pure sine wave. Generally, modified sine wave inverters are less expensive than a pure sine wave inverter, so they are still used in simple systems. But as technology advances, the cost of pure sine wave inverters is coming down, making them much more affordable and the favorite option. Once the charge controller has charged up the battery bank, the off-grid inverter converts the 12, 24, or 48VDC battery bank to AC voltage. The AC output depends on your requirements. In North America, most residential and business use is 120V single phase. Homes will often use 240V split phase for larger loads such as a clothes dryer, well pump, and electric stove. Commercial buildings that use a lot of power will generally have 208V or 480V 3-phase delivered to the building, and it is then broken out to 120V when sent to the outlets. Depending on how you wire the output of the inverter, and which inverter you get, you could have both 120V and 240V as an output. You need to determine what your loads require, and select and configure the inverter accordingly. Most off-grid inverters can not sell extra power back to the grid, with the exception of inverters like the Outback FXR series inverters or the Schneider XW+ inverters. However, an inverter/charger can connect to the grid (if available) to act as a battery charger. For instance, if you have a boat or RV with an inverter/charger, when you connect to shore power, you can use the AC power from the electric grid to charge your battery bank when the solar doesn’t provide enough power. But that AC connection is one-directional, it will only take from the grid, not send back. Likewise, you can often connect a generator to the AC input of an inverter/charger to top off the batteries when needed. This is a common configuration for off-grid homes that need more power in the winter than the sun can provide. When selecting an inverter, you must determine what your maximum wattage draw will be if all of your appliances that may be on at the same time, are on. If you have an 800W well pump, a 100W fridge, five 10W lights, and a 50W laptop, you need to add the wattages together to get at least a 1,000W inverter. You also have to make sure the inverter is able to handle the surge as motors turn on. For example, if your fridge and well pump both turned on at once, the surge could be three or four times the rated wattage. You must be sure the inverter can handle that. Inverters are rated in both continuous wattage and surge. Additionally, you need to select the battery bank size and select the inverter to match. Inverter voltage is not field selectable, they are either 12V, 24V, or 48V, they cannot do all of them, just one. Battery based inverters have a lot of options to choose from. Not all of the inverters have all of the features, so you need to decide which features are required or desired, and select the inverter based on which has them. Some of the features include the ability to charge the battery bank from an AC source like the grid or a generator; even automatically starting the generator to power the built-in AC charger in the inverter to charge up the deep cycle batteries when they are low, and turning it off when they are charged. Some can automatically use the generator to assist with high loads, reducing the need to oversize the inverter for occasional heavy use. Some examples include the Schneider AGS Remote Generator Start, Magnum ME-AGS-N Automatic Generator Start, and the inverter-model-independent Morningstar’s Relay Driver and Solar Converters’ Generator Starter. Since the inverter is often installed in an out of the way location near the batteries, an inverter remote control or display in the living area is useful to keep an eye on the system. Some inverters even have the ability to monitor the system remotely via the web. This is very useful for part time locations that you are not always there to keep an eye on. Many inverters can be stacked to increase either the voltage or the current, or both. This allows you to use multiple inverters in a master/slave configuration, automatically turning on only the inverters as needed, conserving battery power, as you are not providing power to the second inverter when it is not needed. Can larger SolarEdge Inverters handle 3 strings?